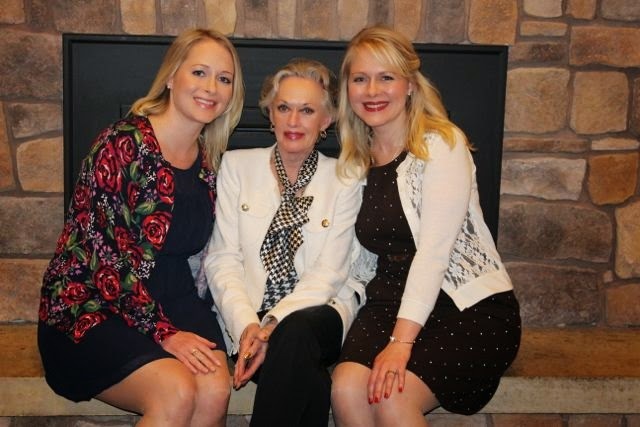 Women on a Mission: Mom Edition: I met my famous relative, Tippi Hedren! So remember when I told you I was related to actress Tippi Hedren? And remember when Lori dressed like her for Halloween? Well, we met her in May! She came home to Minnesota to speak at her hometown (New Ulm, MN) library and so we went down to have a mini family reunion with her the evening after. Let me tell you that we should all be so lucky to look like her when we're octogenarians. Her older sister, Patty, was with her, and they were both whippersnappers! Tippi is passionate about her big cat preserve, Shambala, where she rescues large cats which are mostly bred privately and then cannot be contained as adults in the individual's or breeder's home (despite what they may think when they're little). She was adamant that there needs to be stricter legislation to regulate the breeding of wild animals. Tell your legislators! She also said that anytime a person has the chance, they should adopt a whole litter of kittens. "Best thing I ever did," she said. Shaun loved this notion. As to her sister, Patty, she wasn't in the movies, but she was just as lovely. She and Shaun got on like two peas in a pod.